This Fool just can't take it anymore; shares of Chipotle Mexican Grill have gotten ridiculously cheap. The outdoor seating area of a Chipotle Mexican Grill. Image source: Wikimedia Commons. I take my twin 3-year-old sons to Chipotle Mexican Grill (NYSE:CMG) most Friday nights. But I don't just take them to any old Chipotle; I take them to one of the locations in Portland, Ore., that was closed for multiple weeks last year as a result of e coli. It's probably the safest place to eat in America right now -- though, to be candid, it's obvious that most people don't agree with this logic. Before the outbreak, there was a line out the door most nights. Now, it's a ghost town. 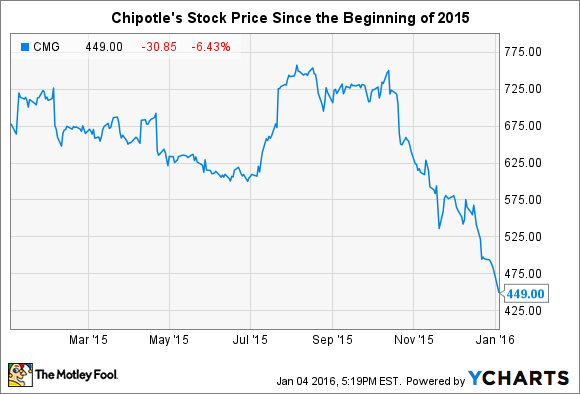 The same can be said for Chipotle's stock, which has fallen 40% since the beginning of last August. This type of response will wreak havoc on Chipotle's same-store sales -- one of the most important metrics when it comes to analyzing retail and restaurant stocks. I read earlier this week, for instance, that an analyst at Maxim Group believes it's unlikely that Chipotle will see same-store sales grow again until 2017. I have no idea how someone could feel confident in a prediction like that, but the market nevertheless seemed to agree, sending shares of the company down more than 6% on Monday. This was great news to me. I'd been lamenting the fact that I hadn't bought shares of Chipotle after being introduced to the chain 15 years ago. Now, I have a do-over. And on Monday, I pulled out my 5-wood and started whacking away at it, buying 10 shares with the intent to average down over the next few weeks and months as it presumably continues to fall. 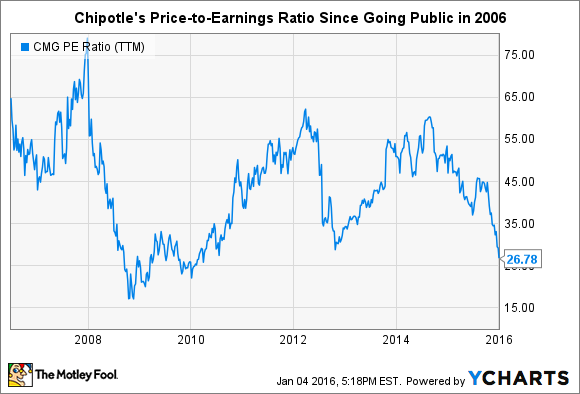 To put its current share price into perspective, this is the lowest valuation for Chipotle stock since the financial crisis -- the worst economic cataclysm since the Great Depression. My hypothesis is that nothing has changed at Chipotle. The food still tastes great. The service is still excellent. And it's still run by what appears to be a highly customer-centric group of executives. As an analyst who follows the nation's biggest banks, I can't tell you how refreshing Chipotle's response to its crisis has been. It came out, apologized, addressed the problem head-on, and promised to do better. I may be wrong, but I suspect that future Harvard Business School case studies will be based on the eventual effectiveness of these moves. It's reminiscent to me of Domino's Pizza's (NYSE:DPZ) commercials from 2010 confessing that its crust tasted like cardboard. Domino's decision to prostrate itself before millions of television viewers seemed like an odd move at the time. But in hindsight it was brilliant, igniting a rapid increase in Domino's sales. 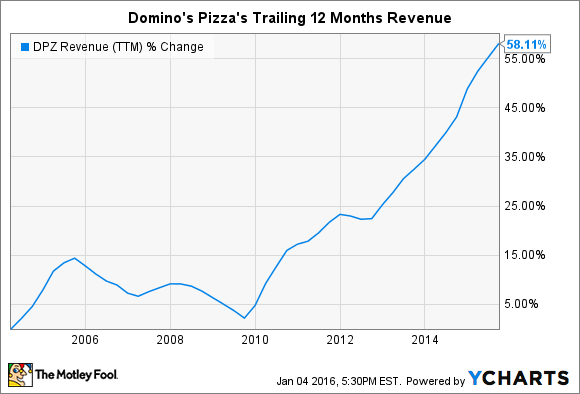 Domino's 2010 self-critical advertising campaign spurred a more than 50% increase in its trailing 12 months revenue. DPZ Revenue (TTM) data by YCharts. Meanwhile, banks such as Bank of America and Citigroup have never fessed up to their role in the financial crisis, which sent unemployment to 10%, and destroyed the balance sheets of countless baby boomers who can no longer look forward to passing money on to their children. The way Chipotle's management has handled all of this, in other words, has only added to my confidence in the company. Doing the right thing is hard, but in the end that's what makes a company great. I prefer to buy low and sell high. And the only time you can buy shares of a great company on the cheap is when a temporary event has caused everyone else to head for the doors. In short, I stand with Chipotle. And I'm putting my money where my mouth is.